Car ferries leave Piombino Marittima almost hourly forward Portoferraio in the summer season. There are also daily ferries forward Cavo and Rio Marina. The main shipping companies are Toremar, Blu Navy, Moby Lines and Corsica Ferries. The crossing Piombino-Portoferraio takes one hour. An hydrofoil service (no cars) takes 40 minutes. 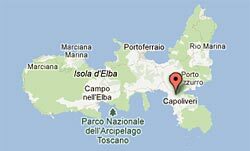 We remind you that the closest harbour to our hotel is Portoferraio 10 (Kms.) and there are much more courses, Rio Marina is 15 Kms. far, Cavo (19 Kms.) far. Our hotel offers all those booking with us the opportunity to purchase Blu Navy ferry tickets at very competitive prices. The ticket, made through the travel agency Ilva Viaggi, will be sent you by email or post. Tickets are available in limited numbers and only at fixed times. For more information and to purchase discounted Blu Navy tickets, please contact our switchboard number +39 0565 968635.